Welcome back to a world where the rich can afford the best in super hero protection, but the poor have to get by with the heroic equivalent of third party, fire and theft. 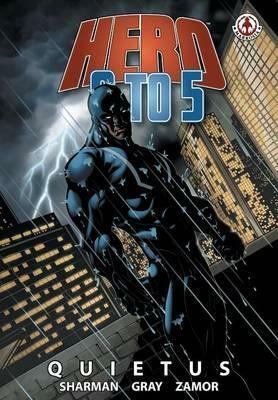 The 'Lone Knight' returns from the pages of Hero: 9 to 5, but how will The Loner and the finest men and women that publicly funded super hero protection can supply cope when a mysterious figure leaves a trail of unconnected corpses in his wake? How will a young hero deal with the loss of his mentor? And, more importantly, how will Thunder Woman get her groceries when she runs into Lash Lady at the store? In a world where being a super hero is just another job, what happens when there's nobody left alive to pay the bill? Quietus ' some men just want to watch the world die.